One way to use less of the sort of energy that changes climate is to get nature on your side. Let water soften the dirt on dishes; let air dry the dishes and the clothes. You can even get heat to help cool the attic, which sounds counterintuitive, but hot air is kind enough to let itself out if given the means. Passive attic ventillation, unlike a noisy exhaust fan that used to kick on frequently in the summer and not do a whole lot of good, is silent and free. It starts with vents running the length of the soffits. Check to make sure that insulation in the recesses of the attic isn't stuffed up against the roof boards, which would block the airflow and cause the wood to rot. Another vent runs the length of the ridge of the roof. Slots are cut along either side of the ridge board, and then some sort of linear vent that lets hot air out is placed over the opening, disguised by pieces of shingle nailed on top. (Here's one of many images on the internet.) We had this ridge vent installed when we got a new roof some years back, but it should be easy to retrofit an older roof. Hot air, which is lighter than cold air, rises naturally. As it escapes through the ridge vent, it pulls cool air in through the soffit vents at the roof edges, thus cooling the attic. It's important to block off any old window-like vents at either end of the attic, so that all the relatively cool air comes in through the soffits. The roofer used a cheapo strip of gauze, which I'm not completely convinced actually lets much air out, so do some research and make sure the ridge vent being installed is of a good design. The vent needs not only to let air out but also keep animals and blown snow from getting in. Behind the beloved Princeton Public Library is the somewhat less beloved parking garage. It's very useful, but perhaps due to it's being located in Princeton, it has more idiosyncrasies than the average parking garage. If Princeton drivers are above average, some credit must go to the practice we get in doing hairpin turns while entering the garage from the north side. Even a slight miscalculation will expose the greenhorn, car angled badly askew as the befuddled driver has no choice but to climb out to get a ticket. Once in, spiraling upward in what should ultimately be a successful search for a parking space, you can contemplate the garage's brief but checkered history. Built on Spring Street, the garage's utility was compromised early on when a historic spring-fed pond oozed up from below to hold the garage basement hostage for an extended period. When you return for your car, you may interact with the ticket machine, whose voice has a tone that to me sounds sexually ambivalent--not surprising in a machine. Very rarely, you may pull out of the garage only to find yourself trapped by a Waste Management truck emptying recyclables. This happened to me recently, and I decided to use the wait time to learn more about the recycling situation downtown. Many of the merchants packed into the buildings downtown have very limited room in back to store recyclables. This relatively new parking garage has unfortunately continued that tradition, with very limited space allocated to storing recyclables generated both by the library and the Witherspoon Grill. When the few rollout bins for foodwaste get filled, employees dump foodwaste in the rollout bins for recyclables, thereby contaminating the recyclables. Overflows of recyclables, in turn, likely get thrown in the trash compactor, from whence they head to the landfill. The recurrent theme here, with flooded basements, hairpin turns and cramped recycling space, is the importance of taking nature and human nature into account, whether in the design of buildings or of recycling programs. It's good news, though, that the Witherspoon Grill is composting food waste. All of the library cafe's paper waste could be added in, but for the lack of space. Using a gas-powered lawnmower has never been a good fit. There's the noise, the weight, the pollution, and the maintenance, particularly the chore of draining the gas every winter and changing the oil--neither of which got done. Deep down, I really didn't want to attend to the machine's petroleum-based plumbing needs, nor worry over the condition of its sparkplug, and so each year the mower ran less smoothly and became more difficult to start. After decades of dealing with these annoyances, I turned a corner one day in our little section of suburbia and saw an electric lawnmower put out on the curb by a neighbor, free for the taking. It turned out to be in working order, and its advantages became immediately clear. It was quieter, turned instantly on or off, and was easily strong enough to cut even thick, tall grass. Though it needed a cord, it was much lighter and very easy to manipulate. After that first mowing of the backyard with an electric mower, I sat down in one of our rarely used lawn chairs, and gazed out upon the cleanly cropped perfection with an unaccustomed sense of satisfaction. A new era in lawn maintenance had begun. The next year, during another around-the-block jaunt with the dog, I acquired a battery powered model being sold for $40 at a yardsale. The battery adds weight, but provides plenty of power and brings relief from the vigilance needed to avoid running over a power cord. In one small corner of life, the end of the internal combustion era has come. An empty gas can molders in the carport, likely never to be refilled. For anyone curious about how much it costs to charge a lawnmower battery, this one took 0.47 kilowatt hours--roughly 8 cents. When the hole gets blocked, water pours in a lovely curtain off the side of the gutter. The constant weight of standing water puts a strain on the nails holding up the gutters, and eventually the nails will pull out and the whole thing collapse. That happened to the rental next door, which made me feel like a good caretaker by comparison until I happened to be walking around a certain house closer to home during yesterday's rain. If everything goes right, it will only take a few minutes to clear the downspout hole and replace a few of the nails with much more sturdy screws, proving yet again that houses, and civilization for that matter, hold together only through timely intervention. While I'm at it, there seems to be a part missing from yet another dysfunctional gutter. Who, I'd like to know, told Entropy it could move in? The short documentary "Passive Passion", by Charlie Hoxie, tells of buildings that use 90% less energy, are more comfortable, and cost no more to build than standard construction. It sounds like a dream, but 20,000 have already been built in Germany--houses, apartment buildings, gymnasiums. They're called "passive homes", which sounds like passive solar but isn't. Instead, collecting solar heat through windows is only a small part of the design, which focuses instead on very well insulated windows and walls, air-tightness to prevent drafts and heat loss, and heat-recovery ventilation. As with solar technology, the U.S. was an early leader in the technology, but due to the promotion of cheap energy rather than efficiency, only about a dozen passive homes have been built here. The film profiles Henry Gifford and others in New York City who have devoted themselves to bringing this building approach back to the U.S.. Unlike the LEED standards, by which buildings are judged in the U.S., a passive home is judged solely on its energy efficiency and air-tightness. And unlike LEED, passive homes are judged on their actual performance, rather than by how well they are projected to perform. Though efficiency is a high priority, the film emphasizes the comfort of these buildings, with their abundant natural light, quietness, and lack of drafts. One interviewee in Germany compared his house to the feeling of putting on a well-made suit that fits just right. "You really get a very comfortable home. With no noise, no draft, with a really good indoor climate and a really good indoor air quality. And you get always with a very low energy." According to Gifford, "It doesn't take anything special, in terms of technology. It just takes a special kind of attention." The extra money invested in insulation and air-tightness is balanced by a big reduction in the size of heating and cooling machinery, and the greatly reduced utility bills. In the U.S., we've been cheated of this "special kind of attention", often ending up in poorly built homes that require big furnaces and air conditioners, and start falling apart soon after the owner moves in. Cheap energy reduces the incentive for the better quality construction needed for high efficiency, and reduces the motivation for innovation. It sounds far-fetched that such a well-built, efficient and comfortable home could be built for the same price as standard construction. But when the head of sustainability at Harvard University gave a talk at Princeton some years back, she told a similar story, that when construction of "green" buildings on campus became the new standard, procedures became routinized and costs came down. Though most people are at least vaguely aware that consuming fossil fuel energy is problematic for our future, the idea of tracking how much we're actually using remains alien. Gifford points this out in the documentary: "Nobody even counts energy yet. People can tell you how many gigabytes and megabytes in a computer, people can tell you miles per gallon for a car. We're still not measuring energy in buildings." For instance, a new car comes with an mpg rating, but when one buys a house in Princeton, does the the seller's information include average annual energy use? If energy from coal, oil and natural gas were more expensive, people would adapt by paying attention to how much they use, and finding ways to use less. The passive home movement goes beyond that, describing technology available right now that can maintain our domestic lifestyles while using a tenth of the energy we currently use. That technological advance was stimulated by the relatively high cost of energy in Europe. If, say, a doubling of energy costs leads to development and implementation of technology that reduces energy needs by a factor of ten, then higher energy costs can actually reduce the cost of living. The trailer for the film claims the U.S. could save $2.2 trillion by harnessing this existing technology. Films on climate change offer the revelation that climate is not a given but instead could change radically as we continue altering the composition of the atmosphere through carbon-based energy use. It's heartening then to learn, through "Passive Passion", that our need for energy is also not a given, and in fact is far more malleable than most people would think. "Passive Passion" is available at the Princeton Public Library. A few snippets can be watched at this link. At a May 4, multi-dimensional eco-conference, entitled "Our Future, Our Challenge" and hosted by the ENACT club of Princeton Day School, gizmologists could get a look at some of the latest electric vehicles. David Crane, CEO of the locally based energy company NRI, showed off his Tesla. A Rutgers prof brought a Chevy Volt. And then there was an electric motorcycle (note the "No Co2" license plate). The sign identified it as a 2012 Zero S ZF9 (Zero for short), with a range of 114 miles, top speed of 94 mph, and a recharge costing all of $1.50. A review in Popular Mechanics of this year's model shows a mileage rating of nearly 500 miles per gallon (electrical equivalent) in the city. That's a big enough number to make one start believing in the future, especially after years of hearing car companies brag about cars whose gas mileage is worse than 20 years ago. The review describes the experience of riding an electric motorcycle this way: "Ever heard birds chirp while cruising along at 50 mph? The aural experience of electric bikes is unparalleled, and the feeling of pushing silently through space challenges everything you’ve come to associate with motorized two-wheeled transport." Other dimensions of the conference were workshops on raising chickens and bees, foraging for edible plants, and starting a farm, along with excellent talks by David Crane and Climate Central's Heidi Cullen. Ms. Cullen announced that the earth's atmospheric CO2 concentration had just that day hit the big four oh oh (400 ppm), which rhymes with "oh, oh!". BPAC (Princeton's Bicycle and Pedestrian Advisory Committee) made t-shirts with this inventive design using the numbers of Princeton's zip code. This clever adaptation of five numbers to fit the shape of a bicycle came to mind after hearing about how another artist helped adapt women's clothes to better meet the demands of a bike. Not being the best fitted to blog on this issue, I will forge ahead nonetheless. In a recent Fresh Air interview of Patricia Volk, about her book "Shocked", she tells the story of how gas rationing in France during World War II prompted women to ride bicycles, which prompted a departure from traditional, high-maintenance, constrictive clothing. The shift was expedited by a surrealist-influenced but practically minded fashion designer named Elsa Shiaparelli. What's interesting in this small example is how bicycles and sustainability, once brought more into the mainstream, began to influence culture, rather than having to constantly adapt to it from a peripheral position. Interesting, too, is how making fossil fuels harder to get actually led to an advance for freedom, in the form of a liberating clothing design. Ours being a culture hostile to the idea of limits, it's worth noting that freedom and the imposition of limits are not necessarily in opposition. Similarly, abundance does not necessarily lead to innovation. The composer Igor Stravinski, perhaps stating it in the extreme to make the point, put it this way in his "Poetics of Music": "My freedom will be so much the greater and more meaningful the more narrowly I limit my field of action and the more I surround myself with obstacles. Whatever diminishes constraint diminishes strength. The more constraints one imposes, the more one frees one's self of the chains that shackle the spirit." Volk's telling of the rationing/bicycling/clothing story can be found by scrolling down at this link. 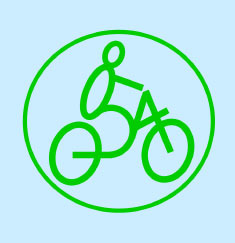 For more info on the t-shirt, the BPAC should be reachable through the town government, or through this local bicycle blog of one of the committee members. On the wall at the Princeton Public Library. A common sight in Princeton is the stray bottle or aluminum can poised to disappear into the system of storm sewers leading to Lake Carnegie. From there, this plastic bottle will head down the Millstone River, past the intake for the treatment plant that provides most of our tapwater, and then down the Raritan River. If it doesn't get hung up anywhere along the way, it will eventually reach the ocean, where it will follow currents and congregate with other vagabond plastics in a widening gyre. Some plastics break into bits that clog the stomachs of marine life. This small-sounding story is really the biggest story of our time, in which one small act, intended or not, is repeated billions of times over, with eventual consequence far removed in place and time from the original action. Collective action is rejected by some political persuasions, but the unintentional form of collective action is happening all the time, with great power to transform our world. Carbon dioxide, released through the burning of fuels from the underground, is perhaps the tiniest yet most powerful example of how small, unintentional acts add up to something world-changing. Small acts by multitudes distant and near, accumulating over centuries, contributed to the widening gyre that became Hurricane Sandy. Movies scare us with big manifestations of Evil wielding powerful weapons. But it's the accumulation of small things, unseen or invisible, slipping not only through the cracks in our storm drains, but also through the gaps in our perceptions and thinking, our regulatory and legal systems, that are proving to be the real enemy. Related Post: Troubled Beverage Containers On the Brink. There's been a long-running mini-controversy in Princeton about what plastics are recyclable. The Mercer County program, which Princeton is a part of, asks that people only put plastics #1 and 2 in the curbside bins. But as you can see in this photo taken at the sorting plant our residential recyclables are taken to, a much broader range of plastics are actually being sorted out and, apparently, being recycled. Separate from our residential program, Waste Management accepts plastics #1-7 from downtown businesses. In another example of the nationwide shift to recycling a greater range of plastics, New York City has begun collecting all hard plastics for recycling. For New Yorkers, according to Mayor Bloomberg, “There is no more worrying about confusing numbers on the bottom of the container. This means that 50,000 tons of plastics that we were sending to landfills every year will now be recycled and it will save taxpayers almost $600,000 in export costs each year.” A NY Times article on the new policy can be found here. What's driving this shift, which Princeton's recycling program through Mercer County has long resisted for reasons unclear, is improvements in sorting technology. As an example, New York City's new policy was made possible through "a partnership with SIMS Municipal Recycling whose recycling facilities are equipped to handle the broad range of plastic recycling." Complementing this new policy, Mayor Bloomberg proposed banning plastic foam containers, which are the least welcome form of hard plastics at recycling facilities. New York City is no leader in recycling. Mayor Bloomberg is still digging out of the hole he dug earlier in his 11 year tenure as mayor, when he cut back on recycling service, thinking it would save money. But the approach they are now using, of expanding accepted recyclables while seeking to curtail packaging that is inconvenient to recycle, is worth emulating. Some previous posts researching where Princeton's recyclables go, and the contrast between the county's list of accepted recyclables and the larger selection accepted by the contracted hauler and sorting plant, can be found here and here. And typing the word "recycling" in the search box at the top of this blog will yield many posts on the subject. I'm posting this too late for most people to react, but wanted to mention this community theater group composed of New Jersians 55 and up. Though it was founded six years ago, a number of us joined this past fall, bringing the number in the troupe to 16. 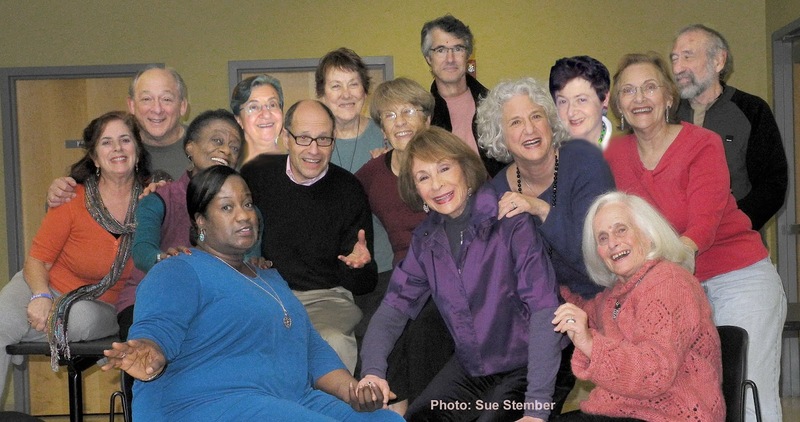 The subtitle of the OnStage group is "The public face of positive aging through theater. ", which if interpreted mischievously might imply that theater makes one age, albeit in a positive way. My first experience with acting came years ago when I threw my back out, whereupon I immediately began exhibiting the mannerisms of someone many decades my senior. It all came so naturally, I figured I must have talent. The nice thing about acting is that one can travel in time, depicting someone older or younger, and not need to throw out the back in order to do so. Tonight's show, also performed two weekends ago at Passage Theatre in Trenton, is called You Win Some, You Lose Some. Our promo describes it this way: "Based on interviews by and with NJ seniors, the performances reflect the triumphs and challenges, successes and setbacks that come with aging. Performances are followed by lively discussions on issues raised by the narratives." The performances, then, are a "giving back" of stories people in the community have shared with us. Tickets are $10 for Arts Council members, $12 general admission. Here's more info about the group, where we perform, contact info, and our director who works improbable magic upon our capacity to portray characters. "OnStage, founded in 2007, promotes original theater that focuses on senior experiences in central New Jersey —and what that means for all of us. Our scripts are gathered from interviews within the community and returned to the community through performances under the direction of Adam Immerwahr, Associate Producer at McCarter Theatre and Resident Director at Passage Theatre. The sixteen members of OnStage perform at theaters, libraries, schools, hospitals, and senior centers. For information about how OnStage might work for your organization, contact (609) 924-5782 or (609) 921-2820." is a tulip, blooming still. Spring has sprung, birds are singing, and our FIOS box in the basement has decided to get into the act with one of its periodic beeping episodes. The FIOS beep can be distinguished from other beeps in your house--the coffee machine or the microwave declaring they are done, or the frig scolding you for keeping the door open too long--by its singular nature, which is to say it beeps just once, every fifteen minutes or so. It's a bit maddening if you don't know where the beep is coming from, and you have to wait fifteen more minutes before another beep will guide you closer to it. On the other hand, a solitary beep causes little notice and can easily be ignored for days. You might think that the box, like the birds, is calling for a mate. It must get lonely down there in the basement, despite the countless gigabytes of television programming and internet data moving through the box every day. In fact, a little attention is all it needs. The beep is the box's way of telling us that its backup battery has lost its charge. Fortunately, the battery only comes into play during power outages, so won't affect day to day operation. Since we've had this FIOS box for many years, Verizon would make us pay for a replacement. In our case, all that's needed to fix it is to pull out the wire connection (See photo) and push it back in again. Somehow (might it be the vibration caused when a particularly heavy truck passes by on the street out front?) the connection gets loose every few months. Caution, of course, and a deep respect for the mysteries of electricity, is highly recommended.